After escaping the Eternal Valley and successfully crossing the Desert of Death, Miky unexpectedly stumbles upon a real god for the first time. The god then questions him about Paradise, the intriguing village where he has just been banished from. As Miky enthusiastically tells the fascinating tales of Abraham (the Fool) and the notorious tragedy of the Giant Snake, he is unaware that the biggest surprise is yet to be revealed at the end of the night by god himself. 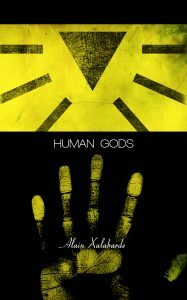 Human Gods is an intriguing reflection on religion, exploring its origins and controversial interpretations. Seen from the eyes of a teenager and written in a cinematic manner, it guarantees riveting adventure and entertainment through a story that will make you wonder of those things greater than us, forever beyond our reach. Read the first chapter for free on PDF right here!